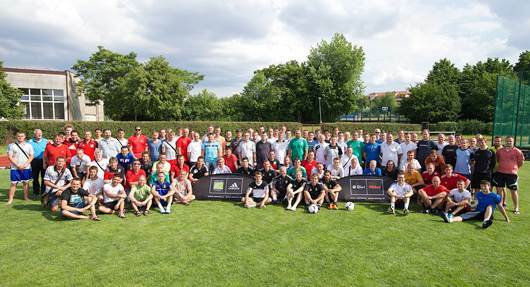 Coerver® Coaching delivered the first ever Youth Diploma course to be held in the Czech Republic, during the weekend of 22nd & 23rd June 2013 in the nations capital, Prague. Over 120 coaches from Czech Republic, Slovakia, Poland, Hungary, Tunisia, Croatia and Serbia spent 2 days working under the expert guidance of Coerver® Coaching co-founder, Alf Galustian, at the Czech University of Life Science (see below image). Tomas Klecka, Director of Coerver® Coaching Czech Republic & Slovakia said “We received really positive feedback from all of the coaches. It was great to see that the course is beneficial to coaches at levels of the game, from grass roots to the professional clubs that attended, including The Czech Republic Football Association, Slavia Prague and Spartak Trna”. Dusan Fitzel, Technical director, Football Association of the Czech Republic said, “It was great to see the amount of detail in Coerver Coaching’s focus on teaching skills. All of our coaches should work with Coerver”. Coerver® Coaching Co-founder Alf Galustian was invited to speak on leading radio station TalkSPORT this week to discuss the Coerver® Coaching programme and youth development in the UK. The interview was facilitated by Danny Kelly and Micky Quinn who contributed to a fascinating 60 minute discussion that sparked a huge number of questions from listeners across the world. 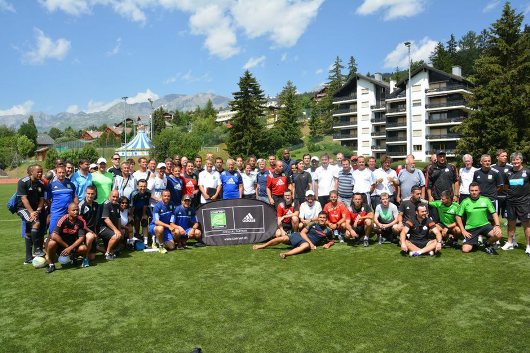 Coerver® Coaching held their first ever Advanced Skills Course for Coaches recently in Crans Montana, Switzerland. 80 coaches attended from over 20 countries including a majority of Coerver® Coaching’s EMEA Directors, and a number of coaching staff from their respective countries. Crans Montana, which is a ski resort in southwestern Switzerland, sits in the heart of the Swiss Alps in the canton of Valais sitting at an elevation of 1,500m above sea level. Due to it’s unique location, many proffesional teams use Crans Montana as a pre-season training base with French giants Olympique Marsellie using the facility only a couple of weeks before the Coerver® Advanced Skills Course. The facility also hosted the Holland national team in advance of EURO 2012 and the facility proved to be a fantastic location to host this world first course for Coerver® Coaching. The three day intensive course included lectures and sessions presented by Coerver® Coaching co-founder, Alf Galustian. Special guest experts included former Scotland Captain John Collins, Newcastle United Academy Director, Joe Joyce and Dr Andrei Stoian, MD (see below images). The coaches received a training session by John Collins demonstrated by youth players from Swiss pro team FC Sion. Joe Joyce gave an excellent presentation into youth development at Newcastle United which was complimented by a top class practical session for attending coaches.